ROBINSON, Bella Rose-Alma Marie (nee Gour) - Edmonton's Burial & Cremation Professionals | Trinity Funeral Home Ltd. 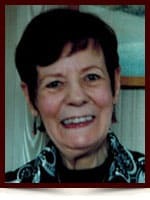 It is with sorrow we announce the passing of our dear sister, aunt, mother and friend Bella Robinson, on May 15, 2015 at the age of 78. Bella will be lovingly remembered by her son Vernon of Thunder Bay; three sisters, Rachel Servini of Edmonton, Amy Vaillancourt of Oshawa and Laverne Kelly of Sudbury, Ontario; one brother, Felix Gour of Toronto, Ontario as well as many nieces and nephews and other extended family members. Bella was born in St. Charles, Ontario where she was schooled in a convent along with her two sisters Rachel and Shirley. As a young woman of 18, she moved to Toronto in 1955 and started her career with the CIBC bank as a teller and remained there until about 1985. In 1955, she also met the love of her life, Tony Robinson, who was from Jamaica, and they married and had two sons, Vernon and Terrance. Bella was a very loving mother and her happiest memories were of her life with her husband and her two boys. She took her role as a homemaker very serious and kept a beautiful clean home for her family and was very involved with her children. Bella was an avid reader and an accomplished poet who had a few of her poems published in W.P. Anthology and received a Golden Poet Award in 1986. In 1985 when her beloved son Terry passed away at the tender age of 25, Bella was devastated and her life forever changed because of this traumatic event. Her sister Rachel went to Delhi, Ontario where Bella was living at the time to relocate her to Edmonton to be close to her family in her time of grief. Bella was predeceased by her mother Fernande Dubois and father Albert Gour, as well as her ex-husband Tony Robinson of Toronto; her son Terry Robinson of Montreal; brother Bob Gour of Hamilton, Ontario; and sister Shirley Edwards (Caby) of Timmins, Ont. A celebration of Bella’s life will be shared with family at the home of her neice on June 20, 2015. You welcome young Spring with wide-open arms! Latent life has now begun. Earth has awakened, listen….. take a look! Yet Nature fairly shouts in all directions! Dandelions are scattered, bluebells ring! Young Spring, your wand has not missed a thing! With your gentle touch…. And His helping hand! Sincere condolences to Vernon and family. I will always remember with fondness the love and kindness Aunt Bella bestowed on me. May you find comfort in loving memories. Mon tres bell, petit Mama you were always there to protect, encourage and inspire me….thank you, I love you so much. To my family I thank you for your support and heart felt thoughts, wishing you all Gods Blessing. I know I reminded you of your son Terry and because of that I held a special place in your heart and you were also a very special great aunt to me. I will miss you and remember you with fond memories. My heartfelt sympathies go to Vernon and his family for the loss of Aunt Bella. I have shared 76 years of closeness with you and will cherish the memories of all our good times together. Until we are together again….